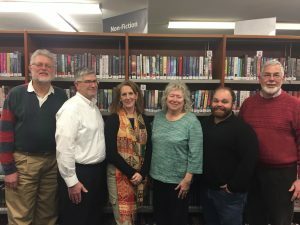 The Board of Library Trustees consists of six members appointed by the Town Manager for three-year terms, with two members appointed annually. The Library Director is appointed by the Town Manager upon recommendation of the Board of Library Trustees. The Trustees are authorized to set policies for the library. The Board of Library Trustees meets on the third Tuesday of the month at 7 p.m. at the library in the James Banda Room from September through June.